Good Hand Hygiene is one of the most important steps that can be taken in the prevention of the spread of illness and disease. When you touch germs, dirt or grime and then touch your eyes, nose or mouth, you have set up the perfect scenario to become sick. Germs can be spread hand to hand or object to hand. Hand washing and using hand sanitizers is a simple way to protect your health and well being. 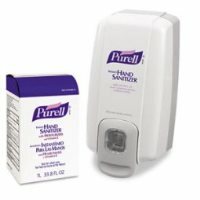 We carry Purell Hand Sanitizer and GOJO Cleaning Products to keep your workforce safe and clean. Who Should be Using Hand Sanitizers? Healthcare Workers: Healthcare workers can be exposed to micro-organisms and diseases in their line of work. Not only can they be infecting themselves with these micro-organisms but they can spread contamination among others if they don’t wash and sanitize their hands. Industrial Workers: Industrial workers work with many different materials that need to be removed from their hands during the workday. They require the use of strong cleaners that have the capability to remove dirt, grime, chemicals and other substances. Food Service Industry: Food handlers need to be sure that their hands are clean when working with food. They can contaminate themselves and others with foodborne illnesses. Students: Students in classrooms are in close proximity and are exposed to germs and illnesses on a daily basis. Washing hands and using hand sanitizers can help with the spread of illness. This helps with absenteeism and makes for more productive classrooms. Students living in dormitory settings have less chance of illness if they are vigilant about good hand hygiene. General Population: Nobody likes to get sick. If hand washing helps prevent sickness, then it is in everyone’s best interest to simply wash their hands or carry a bottle of hand sanitizer for protection. It’s especially important to wash before and after preparing foods, using the toilet or changing a baby’s diaper, touching animals, blowing your nose, caring for a sick or injured person and handling garbage or chemicals.